An unusual sweet treat made sesame seeds, sunflower seeds and your favorite trail mix. Preheat oven to 350ºF. Line a 9 inch square pan with non-stick foil. Spread the sesame seeds and sunflower seeds on a rimmed baking sheet and bake for about 4-6 minutes. Be careful, as they burn easily. Add the coconut and continue baking for another 2-3 minutes or just until the coconut barely starts to brown. Remove from oven and let cool. Using a chef’s knife, carefully chop the trail mix so that big chunks of things like dried apricot and Brazil nuts are no more than 1/2 inch across. The goal of chopping the trail mix is to make the pieces more uniform. If the trail mix bits are already about the same size, you can skip this step. Put the trail mix and toasted sesame seed mixture in a large mixing bowl. In a small saucepan, combine the butter, salt, honey and brown sugar and set over medium heat. Cook mixture until until it reaches 240ºF (soft ball stage) on a candy thermometer, then pour the honey mixture into the seed mixture and stir well. Empty into the prepared pan and press down as tightly as you can using a piece of nonstick foil. It may seem like you have too much to fit in the pan. Just press down super hard. Let cool completely. Lift from pan and cut into bars. At this point you can serve them or put them in the refrigerator where they will become chewier and firmer. Mix and match the trail mix and seeds with your favorite picks. 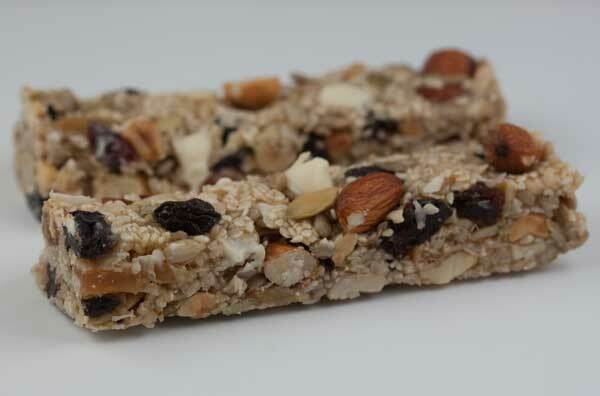 For bulkier bars, swap out some of the sesame seeds and sunflower seeds for extra trail mix and/or throw in some pieces of puffed rice, broken rice cakes or broken pretzels. If adding chocolate chips, try to stick them in after you've put the mixture in the pan, otherwise they will melt.